The Customer Services Department of Oerlikon Manmade Fibers is presenting itself with its extensive product portfolio at ITMA in Milan. 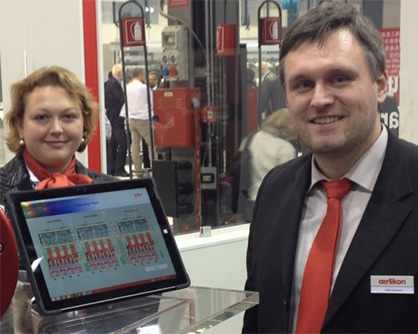 One highlight at the exhibition is the new Multi Machine Access Center from Oerlikon Neumag. Networked production is no longer just a vision of tomorrow. Yet the solutions offered are often very comprehensive. The new Multi Machine Access Center is aimed directly at customers who are looking for a specific solution tuned to their requirements. The innovative Multi Machine Access Center, MMAC for short, permits monitoring of the Oerlikon Neumag textile machines. The scope of visualization is geared to the individual wishes of the customer. Since the MMAC is linked to the process control system, in the highest version it offers a central overview of all the applications provided by the system. Oerlikon Neumag provides three variants of the Multi Machine Access Center: the basic version permits analysis of system data from an office PC that is set up independently of the location of the system and is connected with the process control system via the house network. The mobile version is installed on a Windows tablet and calls up the data via WLAN or VPN. The complete version combines the advantages of both systems. It is of paramount importance that all variants satisfy the increasing demands for improved process monitoring and control. While, with the basic version, even large quantities of retrieved data can be saved for later analysis, the mobile version offers a new level of flexibility. The possibility of continuous and location independent process monitoring is complemented by the option of visual troubleshooting directly on the machine. “Our Multi Machine Access Center is predominantly aimed at companies who, for example, would like to examine and analyze their current process in addition to other functions of the control system online. The mobile version, however, also permits simpler handling for our customers in several respects in their daily work. In technical service it can also help with the interaction between us and our customers”, says Tilmann Seidel, Head of Customer Services Oerlikon Neumag, summarizing the advantages for the customer.